In addition to carrying the largest range of standard garage door types in Bowie, Trust Garage Door Service also stocks a variety of specialty doors to handle situations in which the usual overhead door models will not be suitable. Our range of specialty doors can cover just about any situation a client may present, no matter how unique it is. When you call Trust Garage Door Service you can rest assured that you are getting service from experts who are versed in the latest industry developments and techniques. 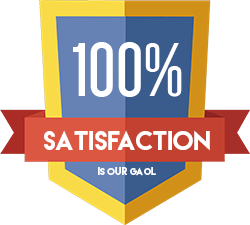 We ensure that our staff holds all relevant and necessary qualifications for each task that they are sent to perform, and that they have practical experience in that particular type of installation as well. Aside from delivering the highest possible level of service, the benefit to you is that they will be able to offer observations that can improve the physical security and accessibility of your business and residence. Insulated doors add an extra layer of protection from the elements. They're commonly used when the contents of a garage need extra protection from exposure to the sun, wind, rain and snow. They are also an important component when a consistent and steady temperature needs to be maintained in the garage area. Insulated garage doors are very commonly requested by clients who have refrigerated warehouses and storage areas, for example. The use of an insulated garage door isn't limited to commercial applications, however. 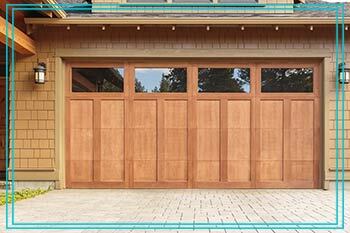 We install insulated doors in residences where owners desire a high level of temperature control in the garage. This can be for use as a home office, as a hobby room, even as a place to relax and watch sports during the seasons with more extreme weather. An insulated garage door can also lead to long-term savings that will pay for its installation, making the home more energy efficient and requiring less in the way of temperature control. 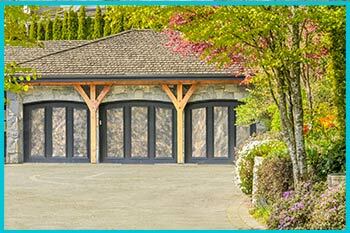 Trust Garage Door Service can create custom insulated garage door solutions for any home. When does a home or business need a fire door in the garage area? Generally speaking, if flammable substances or chemicals are being stored or used in the area, it is wise to install a door that is rated to prevent flames and heat from spreading outside the room. If the garage is being used to store paints, paint thinner, cleaning products or fuel, it is usually best to have a fire door protecting the other areas of the property. There's always a risk of sparks causing a blaze in such a situation, of course, but were you aware that even enough accumulated heat in the garage can cause some flammable substances to combust on their own? If no one is present when a garage fire begins, it can quickly spread and consume the entire property. A fire door in the garage will prevent smaller fires from spreading, and will slow the progress of a large fire, giving the fire department more time to arrive at the scene and control the blaze. As compared to the cost of property damage and loss due to a fire, a fire door is a minimal investment in high-risk garage areas, not to mention a potential lifesaver if it buys people in the building extra time to get to safety. Fire doors that can resist a serious fire for at least 20 minutes are required by local municipal codes for certain types of garages both in businesses and in residences. This is just a minimal safety standard, however. Doors are available that have much higher levels of fire resistance. If there's a significant risk factor present in your home or business garage, installation of a fire door is definitely worth looking into. A high speed door is specially designed for situations where the door will be constantly opening and closing throughout the day. There are a range of different types of doors of this nature, with the primary difference between price tiers being how rapidly they open and shut and how much noise they make. All of the doors of this nature that we sell are extra durable and designed to handle the stress of being opened and closed continually, however.